Win £100 worth of fine wine every month! Subscribe to our newsletter for exclusive promotions, discounts, wine recommendations and stock updates. And you will be entered into our monthly draw to win £100 worth of fine wine. Find out more. Thank you for subscribing. Close this window. Free Wooden Gift Box with your Gift Order! 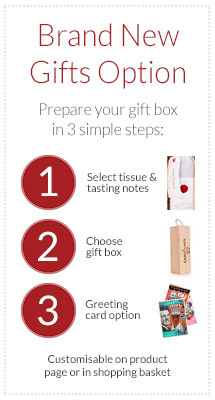 To take advantage of our wine gifts promotion, add your wine and a matching gift box to the shopping cart and the cost of the gift box will be deducted from your order total. France is synonymous with fine wines and, despite the popularity of wine from the New World, French wines remain the benchmark against which all other wines are judged. French wine production is steeped in history dating back to the 6th. century B.C. and traditions which go back to the time vineyards were planted widely by the Romans. The success of French wines is rooted in the geography and geology of the country. The influence of the Atlantic Ocean, Mediterranean Sea and the land-mass of Europe on France's climate together with the rich diversity of propitious geology and soil types have enabled the establishment of ten wine growing regions of the best quality alongside a large number of other vineyard areas. The German influence of Alsace, the celebration that is Champagne, the crisp herbal qualities of the Loire whites, the complexities of Bordeaux and Burgundy, the decidedly different wines of Jura in Franche-Comté, the fruitiness of Beaujolais and the power and sun-drenched ripeness of the wines from the northern and southern Rhône as well as the wines from Provence, the Languedoc and the South West exemplify the wide range of wines and styles of table wine that underline France's pre-eminence in the world of wine. France was the first country to enshrine its wine production in law – the development of the Appellation d'Origine Contrôlée (AOC) system in the 1920s successfully introduced minimum standards both in the vineyard and winery and related this inextricably with the concept of “terroir”, an idea which unifies geographical location, soil and sub-soil, grape variety, climate (including micro-climate) and viticultural practices. The number of AOC wines in France now numbers in excess of 300 some of which are from very small vineyard plots with tiny production levels. Others, such as AOC Côtes du Rhône, cover vast areas with a commensurate production volume. Despite the large scale transition to other cash-crops in the flatlands of the south of France since the 1970s and an even greater emphasis on quality wine production France continues to be the world's largest wine producing country. The challenge of so-called New World wines from Australia, South Africa, Chile etc. has been the motivation for some producers to explore possibilities outside of the AOC system and plant different grape varieties to make what some perceive to be more popular, easier drinking, styles of wine. Such wines are now sold under the classification of I.G.P. (Indication Géographique Protégée) as part of new E.U. regulations governing their former title of Vin de Pays. 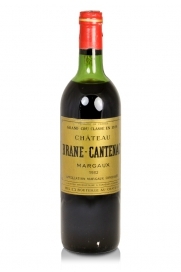 Some of these wines can be very good indeed and command high prices in the market-place. 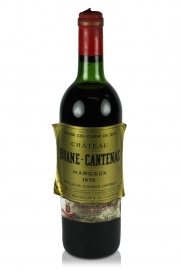 A perfectly mature Margaux that is still an extremely worthwhile red wine with complexity and finesse. We are updating Shopping Basket. The stereotypical Margaux nose comes to the fore after about an hour's exposure to the air. © 2009 - 2015 The Cardinal's Cellar. All Rights Reserved. The Cardinal's Cellar is a trading name of Cardinal Online Ventures Ltd.